Gas Chromatography-Mass Spectrometry (GC-MS) method is described for identification of microbiological degraded fatty acids in vegetable oils as methyl ester in soil matrix. In this paper, vegetable oil samples studied are palm, soybean, and cottonseed oil. Experimental study reveals that the saturated fatty acids viz. lauric acid, myristic acid, palmitic acid and stearic acid in vegetable oils appear to be the least microbiologically degraded in soil matrix when compared with unsaturated fatty acids viz. 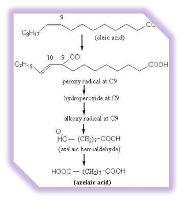 oleic acid, linoleic acid and linolenic acid. It is also observed that microbiological degradation of fatty acid in vegetable oil depends upon the extent of unsaturation of fatty acid in the vegetable oil. Linolenic acid is more prone to microbiological degradation when compared with linoleic acid. These vegetable oils on microbiological degradation give azelic acid and suberic acid. Increase in concentration of azelic acid and palmitic acid is observed. An attempt was made to estimate quantitatively the concentration of palmitic acid in soil matrix mixed with soybean oil for about one year. The concentration of palmitic acid in biodegraded soybean oil is found about 12% w/w, whereas soybean oil contains palmitic acid concentration in range of 6-7% w/w. The microbiological degraded fatty acids in soybean oil are identified as azelic acid, methyl capronate, methyl heptonate and pelargonic acid.